These chicken burgers are guaranteed to please. Bursting with BBQ flavour, these grilled burgers are served topped with crisply cooked bacon and melted cheddar cheese slices for the perfect recipe to serve at your next summer barbecue. Mix first 7 ingredients just until blended; shape into 8 (1/2-inch-thick) patties. Grill 5 min. on each side. Brush with half the barbecue sauce; grill 1 to 2 min. or until done (160ºF), turning and brushing occasionally with remaining barbecue sauce. Top with cheese; grill 1 min. or until melted. 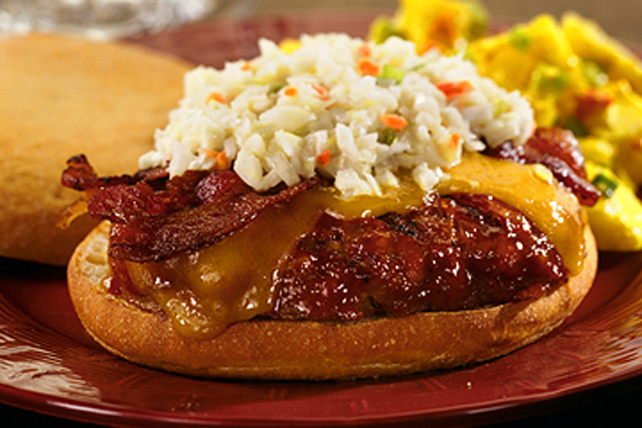 Fill buns with cheeseburgers, bacon and coleslaw just before serving. To prevent food from sticking to the barbecue, lightly brush the barbecue grate with vegetable oil before preheating the barbecue. Or, spray the cold barbecue grate with cooking spray.